Everyone knows how young girls love to dress up and be like Mom. I have just the Nantucket Purse Basket for that special young lady! A Nantucket Lightship Basket Purse that's just her size! Just like my full-size Classic Purse Nantucket Basket, the Miniature Nantucket Basket Purse features all the fine features of my larger, full-size Nantucket Basket purses. Cherry wood base and top plates, hand-tapered and beveled cane staves, fine cane weaving, and steam-formed rattan reed rims, nailed and lashed, with a delicate little bone scallop shell attached to the lid! The Miniature Purse Nantucket Basket has cane-wrapped leather hinges and loops, just like the full-size Classic Nantucket Basket Purse and a bone or ivory closure peg. Cherry wood swing basket handle and bone or ivory knobs and washers. An optional personalized ivory quarter-board, which is traditionally attached to the inside of the Nantucket Basket lid, is available for an additional $75.00. This board can ONLY be engraved with your initials (first initial, middle initial and last initial). A final finish of multiple coats of hand-applied varnish are applied to both the inside and outside of the basket purse body and lid. 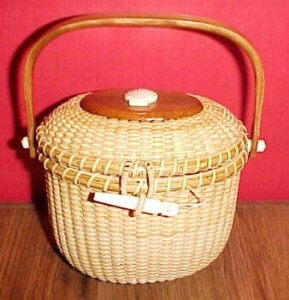 This brings out the full beauty of the natural materials, and helps to protect and strengthen the basket purse. All the hardwood parts are given even more attention to protect and burnish, bringing them a deep luster which is glass-smooth to the touch. These, and many other fine details, set my Nantucket baskets apart from all others. A nice size for the Nantucket basket collector, too! It measures 5.75" long x 4" wide and 6" high at the handle. Fine craftsmanship and excellent attention to detail. Signed and dated on the base. Although I am no longer accepting orders for the Nantucket Basket Miniature Purse, I do craft one or two of these per year. When available for sale, you can purchase it directly from my Simply Baskets website.